Zurvanism is the name of a now-extinct branch of Zoroastrianism that had the divinity Zurvan as its First Principle (primordial creator deity). The name "Zurvan," as it appears in middle Persian, derives from Avestan "zurvan" (meaning: 'time'). The followers of Zurvanism honored the God Zurvan as the hypostasis of time (and space). Zurvanism enjoyed royal sanction during the Sassanid era (226-651 C.E.) of Persian history. However, following the fall of the Sassanid Empire in the seventh century, Zurvanism was gradually supplanted by Islam. In modern scholarship, Zurvanism is sometimes known as "Zurvanite Zoroastrianism" in order to distinguish it from traditional Zoroastrianism that worships the God Ahura Mazda. Unlike Zoroastrianism, Zurvanism did not consider Ahura Mazda to be the transcendental creator of the universe, but one of two equal-but-opposite divinities under the supremacy of Zurvan. The central Zurvanite belief made Ahura Mazda (Middle Persian: Ohrmuzd) and Angra Mainyu (Ahriman) twin brothers that had co-existed for all time. Although the details of the origin and development of Zurvanism remain uncertain (for a summary of the three opposing opinions, see below), it is generally accepted that Zurvanism was a branch of greater Zoroastrianism (Boyce 1957, 157-304); that the doctrine of Zurvan was sacerdotal response to resolve a perceived inconsistency in the sacred texts (Zaehner 1955, intro; see development of the "twin brother" doctrine below); and that this doctrine was probably introduced during the second half of Achaemenid Empire (Henning 1951; Boyce 1957, 157-304). Zurvanism enjoyed royal sanction during the Sassanid era (226-651 C.E.) but no traces of it remain beyond the tenth century. Although Sassanid era Zurvanism was certainly influenced by Hellenic philosophy, whether Zoroastrian Zurvan was an adaptation of an antecedent or alien divinity of Time has not been conclusively established. Non-Zoroastrian accounts of typically Zurvanite beliefs were the first traces of Zoroastrianism to reach the west, which misled European scholars to conclude that Zoroastrianism was a dualistic faith. The earliest evidence of the cult of Zurvan is found in the History of Theology, attributed to Eudemus of Rhodes (c. 370-300 B.C.E.). As cited in Damascius's Difficulties and Solutions of First Principles (sixth century CE), Eudemus describes a sect of the Persians that considered Space/Time to be the primordial "father" of the rivals Oromasdes of Light and Arimanius of Darkness (Dhalla 1932, 331-332). Most of what is known of Zurvanism during the Sassanid period is from contemporaneous Christian Armenian and Syriac sources. The Kartir inscription at Ka'ba-i Zartosht and the edict of Mihr-Narse are the only contemporaneous native sources that reveal anything about Zurvanism. Other Persian language commentaries on the religion were all composed after the fall of the Sassanid Empire. While the Armenian and Syriac sources depict the religion of the Sassanids as having been distinctly Zurvanite, the later native commentaries are primarily Mazdean, and with only one exception (tenth century, Denkard 9.30), do not mention Zurvan at all. Of the remaining so-called Pahlavi texts only two, the Megog-i Khirad and the "Selections of Zatspram" (both ninth century) reveal a Zurvanite tendency. The latter is considered to be the latest Zoroastrian text that provides any evidence of the cult of Zurvan. The foreign accounts of the Zurvanite father-of-twins doctrine is substantiated by only a single Persian language source, the Ulema-i Islam ("Doctors of Islam", thirteenth century), that, notwithstanding the title, was written by a Zoroastrian. There is no hint of any worship of Zurvan in any of the texts of the Avesta, even though the texts (as they exist today) are the result of a Sassanid era redaction. Zaehner proposes that this is because the individual Sassanid monarchs were not always Zurvanite and that Mazdean Zoroastrianism just happened to have the upper hand during the crucial period that the canon was finally written down (Zaehner 1955, 48; Duchesne-Guillemin 1956, 108). In the texts composed prior to the Sassanid period, Zurvan appears twice, as both an abstract concept and as a minor divinity, but there is no evidence of a cult. In Yasna 72.10, Zurvan is invoked in the company of space and air (Vayu). In Yasht 13.56, the plants grow in the manner Time has ordained according to the will of Ahura Mazda and the Amesha Spentas. Two other references to Zurvan are also present in the Vendidad, but these are late additions to the canon. "Eternal Time" does not appear in any listing of the Yazatas (Dhalla 1932). The origins of a cult of Zurvan remain debated. One view (Zaehner 1939; Duchesne-Guillemin 1956; Zaehner 1955) considers Zurvanism to have developed out of Zoroastrianism as a reaction to the liberalization of the late Achaemenid era form of the faith. Another opinion (Nyberg 1931; Zaehner 1955) proposes that Zurvan existed as a pre-Zoroastrian divinity that was incorporated into Zoroastrianism. The third view (Henning 1951; Boyce 1957) is that Zurvanism is the product of the contact between Zoroastrianism and Babylonian and Byzantine religions (for a summary of opposing views see Boyce 1957, 304). 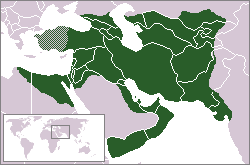 By the Sassanid era (226–651 C.E. ), the divinity "Infinite Time" was well established and enjoyed royal patronage. It was during the reign of Sassanid Emperor Shapur I (reigned 241-272) that Zurvanism appears to have developed as a cult and it was presumably in this period that Greek and Indic concepts were introduced to Zurvanite Zoroastrianism. It is not known, however, whether Sassanid era Zurvanism and Mazdaism were separate sects, each with their own organization and priesthood (cf. Catholicism/Lutheranism), or simply two tendencies within the same church (cf. high/low Anglicanism). That Mazdaism and Zurvanism competed for attention can been inferred from the works of Christian and Manichean polemicists, but the doctrinal incompatibilities were not so extreme "that they could not be reconciled under the broad aegis of an imperial church" (Boyce 1957, 308). Following the fall of the Sassanid Empire in the seventh century, Zoroastrianism was gradually supplanted by Islam. The former continued to exist but in an increasingly decimated state and the remaining Zoroastrians appear to have gradually returned to the Mazdean doctrine prescribed by Zoroaster in the Gathas. By the tenth century, Zurvanism had ceased to exist, leaving Mazdaism the sole remaining form of Zoroastrianism. Why the cult of Zurvan vanished (while Mazdaism did not) remains again an issue of scholarly debate. Arthur Christensen, one of the first proponents of the theory that Zurvanism was the state religion of the Sassanids, suggested that the rejection of Zurvanism in the post-conquest epoch was a response and reaction to the new authority of Islamic monotheism that brought about a deliberate reform of Zoroastrianism that aimed to establish a stronger orthodoxy (Boyce 1957, 305). Another possible explanation postulated by Boyce (1957, 308-309) is that Mazdaism and Zurvanism were divided regionally, that is, with Mazdaism being the predominant tendency in the regions to the north and east (Bactria, Margiana, and other satrapies closest to Zoroaster's homeland), while Zurvanism was prominent in regions to the south and west (closer to Babylonian influence). This is supported by Manichean evidence that indicates that third century Mazdean Zoroastrianism had its stronghold in Parthia, to the northeast. Following the fall of the Persian Empire, the south and west were relatively quickly assimilated under the banner of Islam, while the north and east remained independent for some time before these regions too were absorbed (Boyce 1957, 308-309). This could also explain why Aremenian/Syriac observations reveal a distinctly Zurvanite Zoroastrianism, and inversely, could explain the strong Byzantine and Babylonian influence on Zurvanism (see types of Zurvanism, below). "Classical Zurvanism" is the term coined by Zaehner (1955) to denote the movement to explain the inconsistency of Zoroaster's description of the 'twin spirits' as they appear in Yasna 30.3-5 of the Avesta. According to Zaehner (1961), this "Zurvanism proper" was "genuinely Iranian and Zoroastrian in that it sought to clarify the enigma of the twin spirits that Zoroaster left unsolved." If the Malevolent Spirit (literally Angra Mainyu) and the Benevolent Spirit (Spenta Mainyu, identified with Ahura Mazda) were twins, then the priesthood concluded that these twins must have had a "father", who must have existed before them. The priesthood settled on Zurvan—the hypostasis of (Infinite) Time—as being "the only possible 'Absolute' from whom the twins could proceed," and which was the source of good in the one and the source of evil in the other (Zaehner 1961). The Zurvanite "twin brother" doctrine is also evident in Zurvanism's cosmological origin belief, which in its "classic" form, does not contradict the Mazdean model of the origin and evolution of the universe. It may well be (as proposed by Cumont and Schaeder) that the Zurvanite cosmogony was an adaptation of an antecedent Hellenic Chronos cosmogony that portrayed Infinite Time as the "father" of Zeus (who the Greeks equated with Oromasdes, i.e. Ohrmuzd/Ahura Mazda). The "classic" Zurvanite model of creation, preserved by only non-Zoroastrian sources, proceeds as follows: In the beginning, the great God Zurvan existed alone. Desiring offspring that would create “heaven and hell and everything in between,” Zurvan sacrificed for a thousand years. Towards the end of this period, androgyne Zurvan began to doubt the efficacy of sacrifice and in the moment of this doubt Ohrmuzd and Ahriman were conceived: Ohrmuzd for the sacrifice and Ahriman for the doubt. Upon realizing that twins were to be born, Zurvan resolved to grant the first-born sovereignty over creation. Ohrmuzd perceived Zurvan's decision, which He then communicated to His brother. Ahriman then preempted Ohrmuzd by ripping open the womb to emerge first. Reminded of the resolution to grant Ahriman sovereignty, Zurvan conceded, but limited kingship to a period of nine thousand years, after which Ohrmuzd would rule for all eternity (Zaehner 1955, 419-428). Christian and Manichean missionaries considered this doctrine to be exemplary of the Zoroastrian faith and it was these and similar texts that first reached the west. Corroborated by Anquetil-Duperron's "erroneous rendering" of Vendidad 19.9, these led to the late eighteenth-century conclusion that Infinite Time was the first Principle of Zoroastrianism and Ohrmuzd was therefore only "the derivative and secondary character." Ironically, the fact that no Zoroastrian texts contained any hint of the born-of-Zurvan doctrine was considered to be evidence of a latter-day corruption of the original principles. The opinion that Zoroastrianism was so severely dualistic that it was, in fact, ditheistic or even tritheistic would be widely held until the late 1800s (Dhalla 1932, 490-492; cf. Boyce 2002, 687). According to Zaehner, the doctrine of the cult of Zurvan appears to have three schools of thought, each to a different degree influenced by alien philosophies: "materialist" Zurvanism, "aesthetic" Zurvanism, and "fatalistic" Zurvanism. All three have "classical" Zurvanism as their foundation. "Aesthetic Zurvanism," which was apparently not as popular as the materialistic kind, viewed Zurvan as undifferentiated Time, which, under the influence of desire, divided into reason (a male principle) and concupiscence (a female principle). According to Duchesne-Guillemin, this division is "redolent of Gnosticism or—still better—of Indian cosmology." The parallels between Zurvan and Prajapati of Rig Veda 10.129 had been taken by Widengren to be evidence of a proto-Indo-Iranian Zurvan, but these arguments have since been dismissed (Duchesne-Guillemin, 1956). Nonetheless, there is a semblance of Zurvanite elements in Vedic texts, and as Zaehner puts it "Time, for the Indians, is the raw material, the material prima of all contingent being." Materialist Zurvanism was influenced by the Aristotelian and Empedoclean view of "matter", and took some very strange forms (Zaehner, 1961). While Zoroaster's Ormuzd created the universe with his thought, materialist Zurvanism challenged the concept that anything could be made out of nothing. This view discarded core Zoroastrian tenets in favor of the position that the spiritual world (including heaven and hell, reward and punishment) did not exist. While the fundamental division of the material and spiritual was not altogether foreign to the Avesta (Geti and Mainyu, middle Persian: menog, are terms in Mazdaist tradition, where Ahura Mazda is said to have created all first in its spiritual, then later in its material form), the material Zurvanites redefined menog to suit Aristotelian principles to mean that which did not (yet) have matter, or alternatively, that which was still the unformed primal matter. Even this is not necessarily a violation of orthodox Zoroastrian tradition since the divinity Vayu is present in the middle space between Ormuzd and Ahriman, the void separating the kingdoms of light and darkness. The doctrine of limited time (as allotted to Ahriman by Zurvan) implied that nothing could change this preordained course of the material universe, and the path of the astral bodies of the 'heavenly sphere' was representative of this preordained course. It followed that human destiny must then be decided by the constellations, stars and planets, who were divided between the good (the signs of the Zodiac) and the evil (the planets). "Ohrmazd allotted happiness to man, but if man did not receive it, it was owing to the extortion of these planets" (Menog-i Khirad 38.4-5). Fatalistic Zurvanism was evidently influenced by Chaldean astrology and perhaps also by Aristotle's theory of chance and fortune. The fact that Armenian and Syriac commentators translated "Zurvan" as "Fate" is highly suggestive. No evidence of typically Zurvanite rituals or practices has been discovered and followers of the cult are widely believed to have had the same rituals and practices as the Mazdean Zoroastrians. Such a view is plausible because equivalent ritual practices would have been acceptable to both factions since the fundamental Zurvanite doctrine of the twins did not preclude the worship of Ohrmuzd as the Creator (of all but Zurvan and Ahriman). From the point of view of modern Zoroastrianism (which is today synonymous with Mazdaism), the cult of Zurvan is a dilemma that many wish did not exist. While no obviously Zurvanite elements appear to have survived in modern Zoroastrianism, the sheer force of Zurvanism's overt dualism still finds an echo in western scholarship on Zoroastrianism. The incompatibility of Zurvanite dualism with the strongly monotheistic modern Zoroastrianism has forced present-day Zoroastrians to either ignore that Zurvanism ever existed, declare that its precepts were heretical, or seek to explain it in another way. Particularly problematic is the Zurvanite interpretation of Yasna 30.3-5, which gives Zurvanism its "twin brother" (born of Zurvan) that contradicts Zoroaster's own characterization of Ahura Mazda as the one uncreated God (Yasna 45.2) and the omniscient Creator of all (Yasna 44.7). The pessimism evident in Zurvanite fatalism is also a stark contradiction of essentially optimistic Mazdaism and is a direct violation of what is perhaps Zoroaster's greatest contribution to religious philosophy: the concept of a free will. In Yasna 45.9, Ahura Mazda "has left to men's wills" to choose between doing good and doing evil. By leaving destiny in the hands of fate, the cult of Zurvan distanced itself from the most sacred of Zoroastrian tenets: that of the efficacy of good thoughts, good words and good deeds. …[there must] have been a party within the Zoroastrian community which regarded the strict dualism between Truth and the Lie, the Holy Spirit and the Destructive Spirit, as being the essence of the Prophet's message. Otherwise the re-emergence of this strictly dualist form of Zoroastrianism some six centuries after the collapse of the Achaemenian Empire could not be readily explained. There must have been a zealous minority that busied itself with defining what they considered the Prophet's true message to be; there must have been an 'orthodox' party within the 'Church.' This minority, concerned now with theology no less than with ritual, would be found among the Magi, and it is, in fact, to the Magi that Aristotle and other early Greek writers attribute the fully dualist doctrine of two independent principles - Oromasdes and Areimanios. Further, the founder of the Magian order was now said to be Zoroaster himself. The fall of the Achaemenian Empire, however, must have been disastrous for the Zoroastrian religion, and the fact that the Magi were able to retain as much as they did and restore it in a form that was not too strikingly different from the Prophet's original message after the lapse of some 600 years proves their devotion to his memory. It is, indeed, true to say that the Zoroastrian orthodoxy of the Sassanian period is nearer to the spirit of Zoroaster than is the thinly disguised polytheism of the Yashts. Thus, according to Zaehner, while the direction that the Sassanids took was not altogether at odds with the spirit of the Gathas, the extreme dualism that accompanied a divinity that was remote and inaccessible made the faith less than attractive. Zurvanism was then truly heretical only in the sense that it weakened the appeal of Zoroastrianism. Nonetheless, that Zurvanism was the predominant brand of Zoroastrianism during the cataclysmic years just prior to the fall of the empire is, according to Duchesne-Guillemin, evident in the degree of influence that Zurvanism (but not Mazdaism) would have on the Iranian brand of Shi'a Islam. Writing in the historical present, he notes, "under Chosrau II (r. 590-628) and his successors, all kinds of superstitions tend to overwhelm the Mazdean religion, which gradually disintegrates, thus preparing the triumph of Islam." Thus, "what will survive in popular conscience under the Muslim varnish is not Mazdeism: it is Zervanite [sic] fatalism, well attested in Persian literature" (Duchesne-Guillemin 1956, 109). Thus, according to Duchesne-Guillemin, Zurvanism's pessimistic fatalism was a formative influence on the Iranian psyche, paving the way (as it were) for the rapid adoption of Shi'a philosophy during the Safavid era. The gradual decline and vilification of Zurvanism can be seen in the evolution of the Persian language itself. In Middle Persian texts of the ninth century, Dahri (from Ar.-Persian dahr: time, eternity) is the appellative term for adherents of the Zurvanite doctrine, who claimed that the universe derived from Infinite Time. In later Persian and Arabic literature, the term would come to be a derogatory label for 'atheist' or 'materialist.' The term also appears—in conjunction with other terms for skeptics—in Denkard 3.225 and in the Skand-gumanig wizar where "one who says god is not, who are called dahari, and consider themselves to be delivered from religious discipline and the toil of performing meritorious deeds" (Shaki 2002, 587-588). Boyce, Mary (1957). Some reflections on Zurvanism. Bulletin of the School of Oriental and African Studies 19/2: 304-316. Dhalla, M. N. History of Zoroastrianism. New York: Oxford University Press, 1938, part 5. Electronic edition, copyright 2004 by Joseph H. Peterson and Soli Dastur. Duchesne-Guillemin, Jacques (1956). Notes on Zurvanism. Journal of Near Eastern Studies 15/2: 108-112. Frye, Richard (1959). Zurvanism Again. The Harvard Theological Review 52/2: 63-73. Henning, W. B. Zoroaster: Politician or Witch-Doctor? Ratanbai Katrak Lectures, Oxford, 1949. London, 1951. Shaki, Mansour. "Dahri," Encyclopaedia Iranica. New York: Mazda Pub. Zaehner, Richard Charles (1940). A Zervanite Apocalypse. Bulletin of the School of Oriental and African Studies 10/2: 377-398. Zaehner, Richard Charles (1955). Zurvan, a Zoroastrian dilemma. Oxford: Clarendon. ISBN 0819602809 (1972 Biblo-Moser ed.). Zaehner, Richard Charles (1961). The Dawn and Twilight of Zoroastrianism. New York: Putnam. ISBN 1842121650 (2003 Phoenix ed.). A section of the book is available online. Several other websites (including CAIS) have duplicated this text, but include an "Introduction" that is very obviously not by Zaehner. Zaehner, Richard Charles (1975). Teachings of the Magi: Compendium of Zoroastrian Beliefs. New York: Sheldon. ISBN 0859690415. Yasna 30 translated by Christian Bartholomae. In Taraporewala, Irach (ed.) (1977). The Divine Songs of Zarathushtra. New York: Ams. ISBN 0404128025. The 'Ulema-i Islam. In Dhabhar, Bamanji Nasarvanji (trans.) (1932). The Persian rivayats of Hormazyar Framarz and others. Bombay: K. R. Cama Oriental Institute. The Selections of 'Zadspram' as translated by Edward William West. In Müller, Friedrich Max (ed.) (1880). SBE, Vol. 5. Oxford: OUP. Denkard 9.30 as translated by Edward William West. In Müller, Friedrich Max (ed.) (1892). SBE, Vol. 37. Oxford: OUP. The Kartir Inscription as translated by David Niel MacKenzie. In (1970) Henning Memorial Volume. Lund Humphries. ISBN 0853312559.